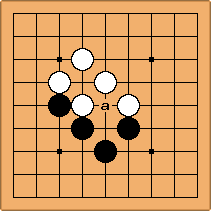 This variation on Go consists of black and white playing at the same time, sharing the turn. Both players chose a point before playing, then they check whether those moves can be done: if the moves coincide, it's a ko (used in the sense of illegal move) until the next move has been played. The f stands for 'Fair', since it's a strategical disadvantage to reveal plans or intentions. The game becomes more difficult one could say, so it's recommended to be close to sdk before giving it a try; it has interesting pedagogical features concerning timing, sente, ko, miai and more. EDIT: We are in the F-Go Room (Social) of KGS. If both players choose E5, this point becomes a kind of a ko, a real move has to be done to leave that point available. If then both players choose the same move at a, they can't play E5 either. Another rule: the captures are made in relation to the situation on the board before the move. a was a capturing stone, but it has been captured. In this position, if white plays a and black plays b, white's move has no liberties and is removed from the board; but it's perfectly legal, since a in the original board is not captured. In this example white does have the stone W. Unlike the first example, white b is 'deliberate' suicide. This remains to the election of the players; F-Go can be played according to New Zealand Rules. Each turn, both players select an empty available intersection, or pass. When ready, players reveal their choice. It is forbidden to create an exact replica of an earlier board position (Ko). If a move would result in such a repetition, it cannot be played. 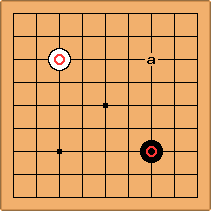 Otherwise, the move is played, and all markings are removed. A move is one black stone and one white stone (the "newly placed stones"), played as follows: 1) Place both stones. 2) Remove any stones with zero liberties at the end of step 1, except the two newly placed stones and those connected to them. 3) Remove any stones with zero liberties at the completion of step 2. Note a move may also be one stone and one pass. The game ends with a simultaneous pass and an agreement on the score, analogous to normal Go. To add a Game Theoretic twist partly controlling gambling, change F-Go's strong implicit communication (revealed move choices) to outright verbal negotiation. Each turn, players attempt to agree on a simultaneous move (... B:"If you play x, I want y." W:"If you play y, I would play z." B:"Very well, I accept move (y,z)."). Rule of ko ultimatum. (This prevents a unilateral rejection of negotiation. Note it does not prevent all threats to make ko.) Suppose one player can issue an ultimatum, "I'll be happy playing x if you play anywhere else, anywhere but x itself (making my best move illegal)!" If the second player can make a similar ultimatum about the intersection x, then the first player has a chance to play elsewhere, giving up x. Otherwise, they have an agreement on marking x ko. But if the second player cannot ultimatum x (that is, allowing move (y,x) for any legal y) and stubbornly insists merely, "If you play x, I will play x..." they are essentially the responsible party for a ko at x. Now, the first player (the ultimatum issuer) may accept move (x,x), invoking the rule of ko ultimatum. They mark x and any intersection of their choosing as ko. 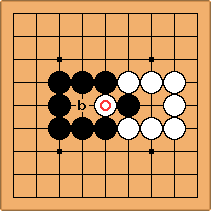 If no moves are left after negotiation, players select and simultaneously reveal their choices as in regular F-Go. F-Go with Bargaining has simultaneous potential to be both more cutthroat, and more fair. In theory, the leader can use ko ultimatum to reduce the odds of an upset. Two friends who agree not to quibble over small stakes can use this variant share their understanding of Go. MrMormon: (there might be another article or L19 post on this, but I'm not sure) The first problem with simultaneous moves is that there may be a case in which there are no possible moves for either player besides the intersections they already simultaneously tried. I can't think of another way to handle that edge case besides either voiding or immediately scoring the game. The second problem is when the end of the game is near, the only remaining moves besides the big ones that can't be played are playing in one's territory. Obviously, then, both players should pass, so the real second problem is that some big moves will never be played. That's not my preference. Lancer: I don't see why it's a problem ^^: if yose is not trivial for at least one of the players, it will be played. Slarty: If players reveal their choice at the same time, F-Go will include an element of randomness (players play mixed strategies - e.g. will you spend a move defending or tenuki?). Another variant exploring this, apparently played in Korea, is roll a die to determine whose move is next. For F-Go, if the players "talk over" their moves beforehand, the game should behave something more like Go. (This will another ko rule). Jolly good stuff. Reminds me of ChoiceGo. MrMormon: There should only be randomness if the two most important plays are equal in value. If you want to talk about a game with a lot of player agreement, try Go Back. Slarty: Here two diagrams I've come up with considering your statement, MrMormon. The finer issues are ko and what we mean by a 'play'. 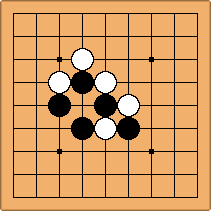 F-Go plays are simultaneous, and even in normal Go, white and black's move of choice in an area can be a line apart. This example probably needs to be explained. For now, I claim these will reveal a mixed strategy is necessary, and that with communication beforehand, the result is much more peaceful! Where do you really want to play? If black always plays a to take the two stones, white will choose a as well. When a is illegal, white has an advantage. As concrete as it gets? ArsenLapin? : Slarty told me that in the case of a semeai that ends in a tie, like in the diagram, both players' stones should be captured. I thought this could be declared a ko: Black cannot capture the white stones and White cannot capture the Black stones. Lancer: This is the same as in the 3rd diagram. On the other hand, it can be a ko if there are 2 shared liberties.